The grants include a $1.5 million clinical grant, awarded by the Substance Abuse and Mental Health Services Administration in November to, in part, help fund Project ECHO–an effort to enable doctors in widespread Pennsylvania counties to connect with experts in opioid addiction. Via teleconferencing, they have access to education and assistance with difficult cases. Grigson also expects to hear this month whether the center will receive two additional grants totaling more than $100 million, which would expand referral services, educational outreach, translational research, screening and prevention projects, and new treatment methods. Founded just over a year ago, the center has wasted no time building a broad plan of attack. See photos of the 4th Annual Penn State Addiction Symposium on Flickr. 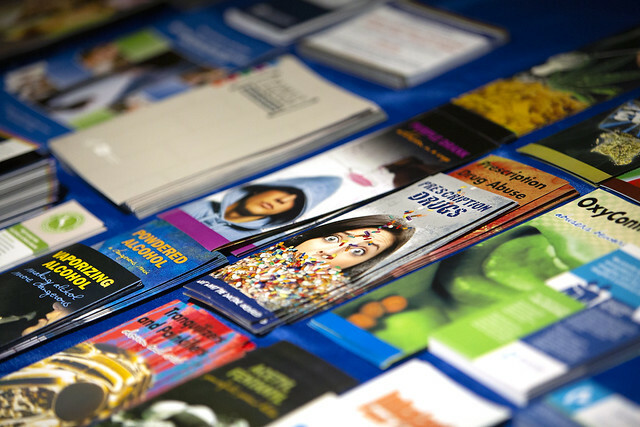 The center’s education efforts include addiction prevention sessions in Pennsylvania schools. Physicians are also being educated via Project ECHO and the Addiction Center for Translation’s annual Penn State Addiction Symposium. The 4th annual meeting took place on Nov. 28, bringing Pennsylvania medical students, clinicians, researchers, policymakers and public health experts together in Hershey to share their latest progress in the fight against opioid addiction. The Addiction Center for Translation’s current clinical endeavors include a new hub-and-spoke design for a medication-assisted treatment program that provides revolutionary care access for Pennsylvania patients. The treatment escalation network allows primary care physicians to refer patients who need extra support to a more specialized, intensive recovery program. Yuval Silberman, third from right, assistant professor in the Department of Neural and Behavioral Sciences at Penn State College of Medicine, answers a question during a discussion session at the Addiction Symposium. Reedy-Cooper contributes to the College of Medicine’s physician education efforts, giving lectures to other doctors on screening tools and the appropriate referral process for patients who need extra help. Kawasaki assists with the Addiction Center for Translation’s research initiatives in an effort to close the gap between bench science, clinical research and patient care. In-progress research includes studies on mobile technology to monitor treatment and recovery, a headband tool that measures brain waves to help predict relapse, a genetic screening test to identify patients at high risk of dependency, a protocol to replace opioids with more benign pain medications for new mothers and more. Researchers share their latest findings during a poster session at the Addiction Center for Translation’s 4th Annual Penn State Addiction Symposium. Entry filed under: Features. Tags: addiction, Addiction Center for Translation, opioid epidemic, Penn State Addiction Symposium.